High silver content is the base for today's 1957 Franklin half dollar value. Currently (4/22/2019 ) each is worth $5.63 . Circulated, worn examples move with the silver price causing values to change week to week, year over year. Despite the highs and lows of silver spanning the decades, what started out as 50 cents has grown in value to a minimum of $5.63 today. Amazing. A second consideration of your 1957 half dollar is judging its condition for possible higher collector value. Defining what is collectible is the easy part; it's the grade known as "uncirculated condition", specifically there is no wear on the coin. However deciding if your coin is "uncirculated" is less easy. 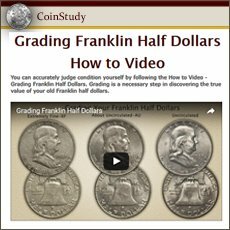 Below the value chart is more detail about grading your Franklin half dollar. Pictured is an uncirculated 1957 Franklin half dollar. A nice quality coin, still covered in original mint luster, it would be a fine addition to a collection. Value of this half dollar is in the $7.16 to $7.39 range. Also there are gem examples known, in an elite value class, auction results of one these is further down the page. Clearly the action is in the uncirculated grade. 1957 half dollars were minted at only two of the three operating mints at the time. 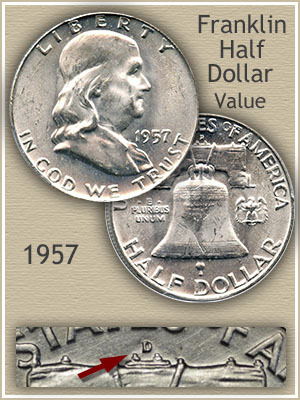 The value charts lists the values as similar, however the Philadelphia 1957 half dollar is the least encountered. Almost four times as many Denver Franklin halves were struck compared to the Philadelphia issue. Personally, if deciding between two coins to keep, I would lean towards the Philadelphia coin, especially in higher condition. Philadelphia did not use a mintmark, the Denver mint placed a "D" on the reverse. 1957 Franklin half dollar value reached $400 for the coin pictured. It is the amazing state of preservation that drew the attention of serious collectors and serious bids at auction. Although millions of 1957 Franklins were minted few survive with this stunning eye appeal. The color of the toing is typical of coins from original issue mint-sets. These mint-sets were purchased direct from the mint and collectors added them yearly to their Franklin half dollar collections. Undisturbed a delicate multicolor toning developed enhancing its appeal. Additionally this half dollar avoided contact marks, a typical occurrence with the minting process. Small nicks and scuff marks are the norm for any coin. Avoiding marks for such a large coin is rare, developing stunning toing for any coin is rare, a combination of the two in a single coin is... very rare. It is the challenge of finding and the excitement of adding these coins to a collection that drives the price. One of the challenges facing you when determining condition is the low relief - shallow design of these coins. Also, by 1957 the master die used to produce working dies was not in the best of shape. Over the years it had lost a significant among of the finer detail, noticeably within the hair. Specific markers used to grade this year have been adjusted in the descriptions. Uncirculated: Strict definition of the "uncirculated" grade is - no wear to the surface. As mentioned above your coin may have a blurry appearance, because of the state of the die striking the coin. This does not preclude the uncirculated grade. Unbroken luster on the high points confirms the coin never circulated. Franklin's chin, cheek and the top of his head are the areas to judge. 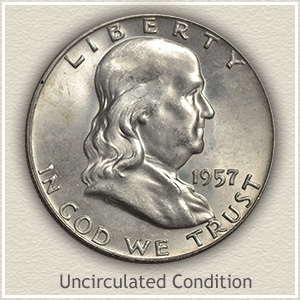 About Uncirculated: Slight wear with minor removal of metal is a coin in "about uncirculated" condition. Look for a dimming of mint luster from the high points of the design to detect any wear. Any color change and dulling of the shine are clear indications the coin saw use. Marked on the image are the areas prone to wear, center of the Liberty bell and the rounded portions of Franklin's face and hair. Light wear is acceptable and notice some luster does remain. About uncirculated is the important break between 1957 Franklin half dollar value tied to silver and its collector worth. 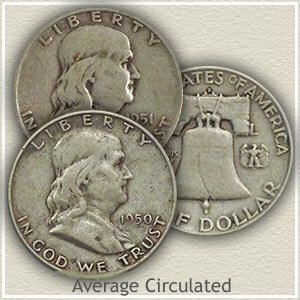 Average Circulated: All mint luster is gone replaced by noticeable wear, a once brilliant white is now the typical light grey color of a circulated silver coin. In today's market it is the silver content setting the value of this half dollar. If the Liberty bell is smooth with no lettering visible there is no doubt it is priced in the bullion silver range. 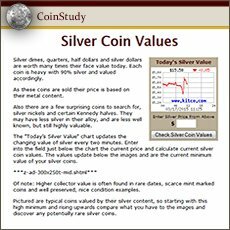 Return to Coin Values Discovery... find 1957 Franklin half dollar value and... a complete index of image and text links to all US Coin series, from Cents to Gold. 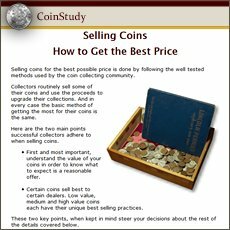 Old coins retain a strong collector following. Walking Liberty halves are an example highlighing the value of silver in old coins. Additiionally, within each series are rare date and mintmark combinations with even greater demand. Revisit your box of old coins, today's value charts show a steady increase. In today's market understanding the condition of your old 1957 Franklin half dollar is the key to realizing the bullion minimum value from the higher collectible value. Check the date and mintmark on the charts, but importantly compare your coin to the grading images to find its accurate value. Every classic, obsolete silver half dollar is worth a minimum of $5.63 each. Additionally, the majority dated before 1916 are worth far more. From your 1957 Franklin Half and going back to the Walking Liberty series, Barber, Seated Liberty Halves and the early Bust halves all have their very rare dates. Value charts cover each series.